Home Fronts of the Empire-Commonwealth: Imperial Interconnections and Wartime Social Transformations during the Second World War is a major Arts & Humanities Research Council-funded project (grant reference AH/J000019/1). In 2012 Dr Yasmin Khan (Principal Investigator) and Professor Ashley Jackson (Co-Investigator) won £190,000 from the AHRC under the Early Career Research Grants scheme for a two year project that will lead to the production of three monographs and a range of other scholarly outputs. The grant also funds the appointment of Dr Gajendra Singh as a Research Fellow based at Oxford and with a Visiting Fellowship at King’s College London. The Second World War was a transformative experience for millions of people though much public and scholarly understanding of the conflict still focuses overwhelmingly upon the impact in Europe and upon fighting fronts such as the Western Desert. Interest in the manifold non-fighting aspects of war, such as logistics, and the manner in which fighting fronts depend on them, remains undeveloped. So, too, does our understanding of the interconnectedness of the war effort of disparate colonial or semi-colonial territories and regions. The links between the war experience of countries in South Asia and the Middle East is seldom adequately understood, and how, in turn, the war in these regions was an integral part of the British – and indeed the Allied – war effort. 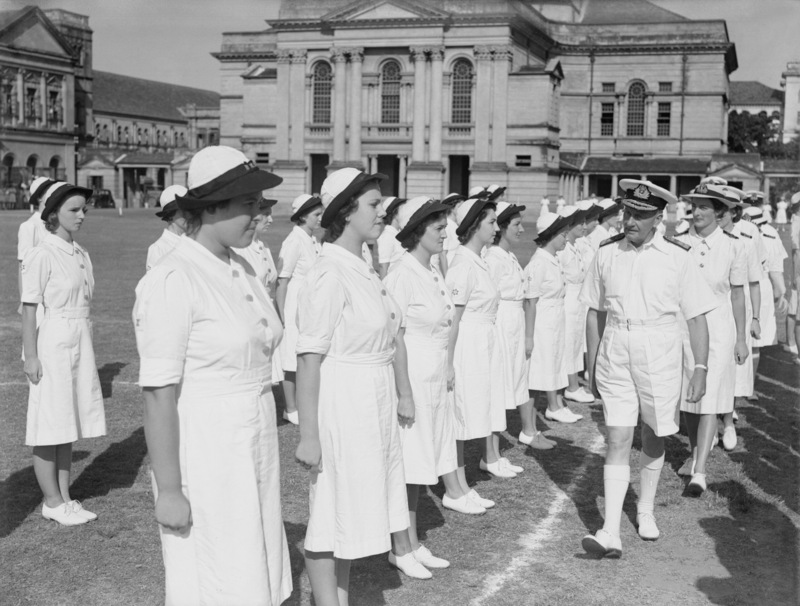 Colombo, Ceylon: Admiral Sir James Somerville, Commander-in-Chief Eastern Fleet, inspects members of the Women’s Royal Naval Service on his birthday, 17 July 1944. Copyright Imperial War Museum. The war came to remote parts of rural India and Iraqi and Iranian towns alike, in the form of military recruitment, civil labour conscription, food shortages, fighting, propaganda, and political competition. Imperial power connected remote regions to global economic, political, and military currents. Many people in Britain’s empire, and a range of fringe territories and semi-independent countries, may not have been aware of the causes of the conflict. The trans-national effects of the war are often regarded simplistically as one-way relationships between metropole and periphery. This project aims to considerably broaden our understanding of the full impact of war in the widest sense by investigating imperial interconnections and social transformations during the Second World War in Iraq and India from 1939-45. The project looks beyond national, and even imperial, history, to understand the war in regional and international terms – for example, the fact that the ‘British’ war effort in the Middle East and Asia was not only intensely ‘imperial’ but that it also involved the policies and personnel of America, China, France and other nations. This project aims to emphasize the importance of trade and supply routes and intra-periphery interactions, and to recover the role of imperial home fronts in India, Iran, and Iraq from 1939-1945. The project is propelled by a desire to understand how local civil and military societies interacted, how society was changed through war and affected by it and how wartime imperial penetration still resonates. Research of these two cases, South Asia and the Middle East, will be linked to the broader research problems by workshops; though the two investigators will be writing on defined regions, the project is very much about building global networks and understanding of these themes relating to all parts of the world.